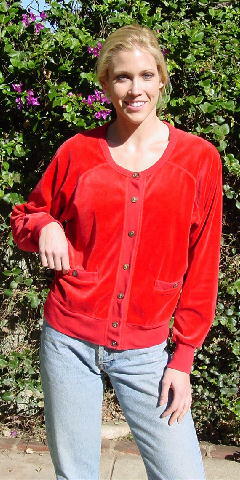 This vintage red-orange Sonia Rykiel velour jacket has 7 metal snaps down the front and 1 on each lower pocket. It has a horseshoe neckline, 3 inch band sleeve cuffs, a 2 3/4" band waistband, and raglan sleeves. There is a faint mark between the 3rd and 4th snaps whichdoesn't show when the jacket is closed. The metal snaps all have elevated X's and Sonia Rykiel engraved on them. The jacket was made in France. It was worn in a photo shoot with a Betsey Johnson short dress and multicolored striped tights. neckline to end of sleeve 29"